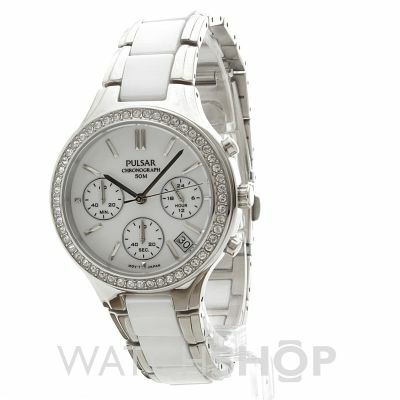 Pulsar PT3305X1 is a beautiful and eye-catching Ladies watch. Material of the case is Stainless Steel while the dial colour is White. The features of the watch include (among others) a chronograph and date function. 50 metres water resistancy will protect the watch and allows it to be submerged in water for periods, so can be used for swimming and fishing. It is not reccomended for high impact water sports. The watch is shipped with an original box and a guarantee from the manufacturer. So pleased with this beautiful watch! Fairly light, contemporary bracelet with a lovely face and easily readable dials. Setting process was also very simple. Have a Citizen ladies chronograph which needs repairing and bought this as a standby however, it is so pretty that I have been wearing it as well as my other watch = Service from Watch Shop was superb with speedy delivery and I would have no hesitation in recommending them or this beautiful watch! I was looking for a smarter daytime watch and this is exactly done the job! Its gorgeous. Smart watch of a good size, not too big or in your face. With a little bit of bling, but again not too much to be In your face. Its a beautiful watch. I have got quite big wrists and it is slightly too big so Im going to try and get a link removed today. The watch is just beautiful. Perfect size, looks great with any outfit. Fastening is very secure. A little bit of bling thanks to little Swarovsky diamonds but not too much . I cant wait to wear it... I havent received it yet- its my Mothers Day gift! I bought this watch for my best friends 50th birthday. I gave it to her early as we were going on holiday and she absolutely loves it . Im sat there looking at the watch wishing I had bought one for myself. Its a beautiful watch and not too big and not to small. In short its a beautiful watch . I love this watch. It looks stylish and the mix of silver and white really adds interest. Had a couple links taken out but that was expected. Comfortable to wear. Its just what I was after. Very happy. I bought this watch as a present for my wife. It is a lovely watch, and it is really easy to operate. The pictures on the site cant quite make the watch look as nice as it does in real life. Bought a ladies pulsar chronograph watch pt3305x1. its a very attractive time piece, beautifully finished, in a bright crisp white and stainless steel. With sweet diamond effect crown. The strap was easy to adjust, but still very secure. I personally want a gentlemans one now. For the money you Cannot go wrong. Bought This product for my wife coz its looks very smart and affordable for the Make pulsar above all a very unique collaboration between Pulsar and swavroski elements on white ceramic. Very elegant. Size : Medium not too huge not too small on the wrist and thats how I want a watch to look on a ladys wrist, water resistant too. This watch was the perfect gift for mothers day. It looked elegant and chic and my mother was very pleased with it. Definitely recommend it to anyone. Love this watch its stylish and modern with just a hint of bling, so not in your face, the strap is slightly tight but themn again i have chunky wrists, but i contacted the Watchshop and they are going to send me a couple of extra links, i really do love this watch speedy delivery well packaged to avoid damage during transit and excellent customer aftercare! highly revommend it! This watch is absolutely gorgeous, well worth its money. Beautiful gift for a lady. Would definitely recommend. Had a pleasant transaction, fantastic speedy delivery. Would definately use again and recommend.